Three more rice farmers have challenged President Granger‘s revocation of leases for state lands situated in the Mahaica/Mahaicony Abary main canal in the rear of Number 40 Village, West Coast Berbice. According to court documents seen by this newspaper, Fariel Johnson, Doreen Monah and Sharon Solomon have filed legal petitions in the High Court to challenge the revocation. The fixed date applications filed by attorney, Anil Nandlall and Associates are set to be heard by Chief Justice (Ag) Roxane George on March 21. 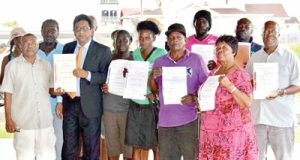 In their applications, the farmers are seeking declarations of the Court that cancellation of their leases are contrary to and in violation of Article 142 of the Constitution of Guyana, and are unlawful, null, void and of no effect. Among other things, the applicants are also seeking an order of the Court prohibiting servants and/or agents of the (overseer body) Mahaica/MahaiconyAbary Agricultural Development Authority, (MMA/ADA) or any other officer of the state from entering upon, remaining, occupying or in any manner whatsoever interfering with their quiet and peaceful possession, occupation and enjoyment of lease of State lands for agriculture purposes. Added to that, the farmers are asking the Court to award them damages in excess of $1 million each for the breach of fundamental rights and freedoms guaranteed to by Articles 142 and 153 of the Constitution. In the grounds of the application, farmer Fariel Johnson said that she, along with her daughter and son-in-law, had applied for lease to State lands located north at Seafield Village, West Coast Berbice. The claimant said that she complied with the requisite requirements and paid the necessary fees to the MMA/ADA and was subsequently issued a lease under Section 3(b) of the State Lands Act, Chapter 62:01 and in accordance with Act No. 27 of 1977. The lease was for between 8-13.844 acres of State land situate north of the MMA Main canal in the rear of Plantation Seafield, on the West Coast of Berbice. The farmer stated that “Upon receipt of the said lease, she and her relatives did not commence occupation of the said land immediately as a rice farmer, Mr. Lincoln Samaroo of Washington Village; West Coast Berbice was in possession of the said land. Sometime in or around April, 2015, Lincoln Samaroo removed from the land and Johnson commenced occupation of the land and to date remains in occupation. The woman claims that she was/is still unaware of the reason why her lease was cancelled and to date, no one has furnished her with any reason whatsoever in relation to the same. Further, the applicant is contending that at no time was she afforded a hearing by any person or body or authority offering her an opportunity to show cause why her lease should or should not be cancelled. Notwithstanding, the lease holder says she remains ready, able and willing to pay the annual rent to MMA/ADA. This is not the first time that legal challenge has been mounted against the revocation of leases to State lands in the West Berbice area. Last year, Chief Justice (CJ) George ruled in favour of a group of farmers, who challenged the constitutionality of the revocation of lease by President Granger. Their leases had been issued under the purview of President Donald Ramotar. The farmers sought over $5M in damages for breach of their fundamental rights and freedoms as guaranteed by Articles 142 and 153 of the Constitution of Guyana. However an appeal has been filed to challenge the ruling by the CJ.